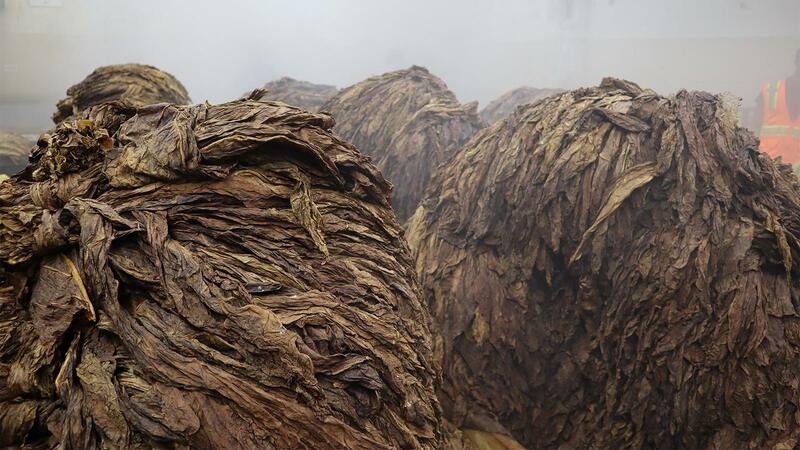 Misty and damp, the moisturizing area hisses like a shower room as workers bring previously baled, dry tobacco back to a more supple state by running it through a fine spray of water. Normally, when I do a walking tour of a factory, I try to show nearly every step of the cigar-making process in a series of sequential pictures. And that’s precisely what I started to do at Tabacalera de Garcia in La Romana, the Dominican Republic, until my camera died. Well, more like the battery died. I know, rookie mistake, but this is a new camera and I had no idea how fast it ate up power. Plus, it waits until the last minute to tell you that you’re in danger of the battery dying. No matter. I can only blame the camera and the learning curve so much. It won’t happen again. 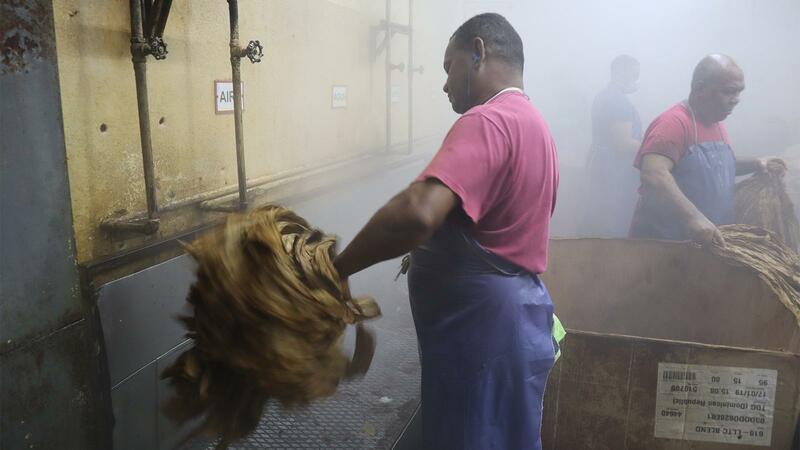 I got as far as one of the drying rooms at Tabacalera de Garcia, before my screen went black. That means that I have no shots of the rolling tables, aging room or packaging department. Nevertheless, I would still like to share some of these photos with you. They give some insight into the cigar-making process in an up close and personal way. 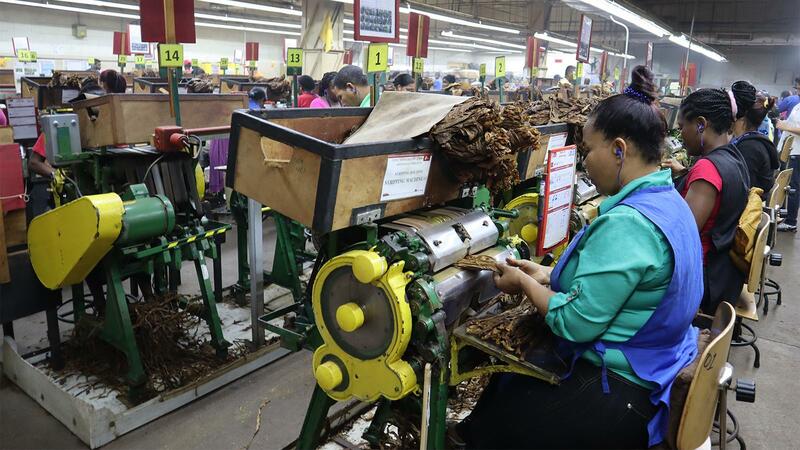 Tabacalera de Garcia is the largest factory in the Dominican Republic, and it celebrated its 50th anniversary this year. 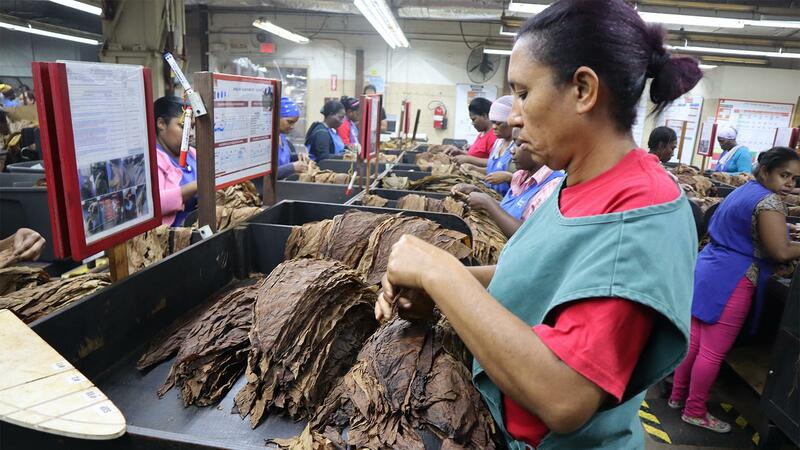 It makes more than 30 million handmade cigars each year, most of them Romeo y Julieta, Montecristo and H. Upmann. I’ve heard some cynical cigar tourists say that if you’ve seen one cigar factory, you’ve seen them all. I disagree. Sure, there are some commonalities between factories, but every cigar-making facility, big or small, has a personality of its own. Rehumidified piles of tobacco sit in shaggy heaps while spray valves keep the room hazy with moisture. Called despalillo in Spanish, the destemming process is done on very old, heavy-duty machines, some of which date back to WWII—and they certainly look like it. 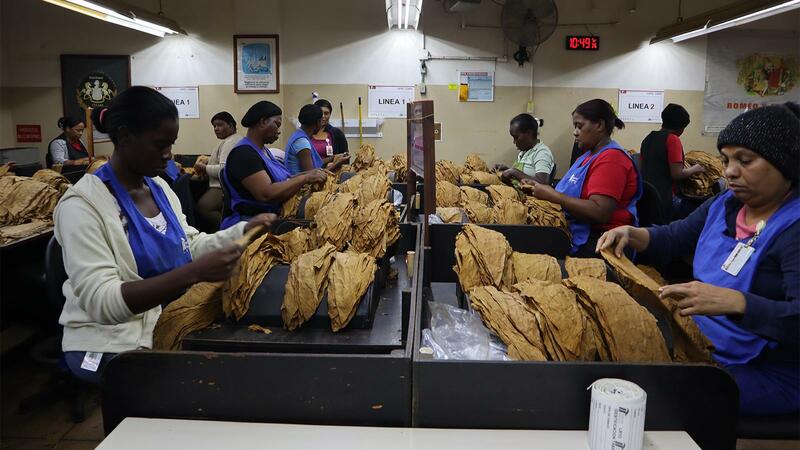 The central vein is removed from the tobacco leaf, as it’s too thick and coarse for a cigar. In the sorting section of the factory, an employee separates Dominican binder leaves and arranges them by size. Wrapper leaf is sorted in a separate room. Here, the workers sort Connecticut shade wrappers by color. Their eyes are keen enough to detect subtle differences in hue and tint that the average person would probably miss. 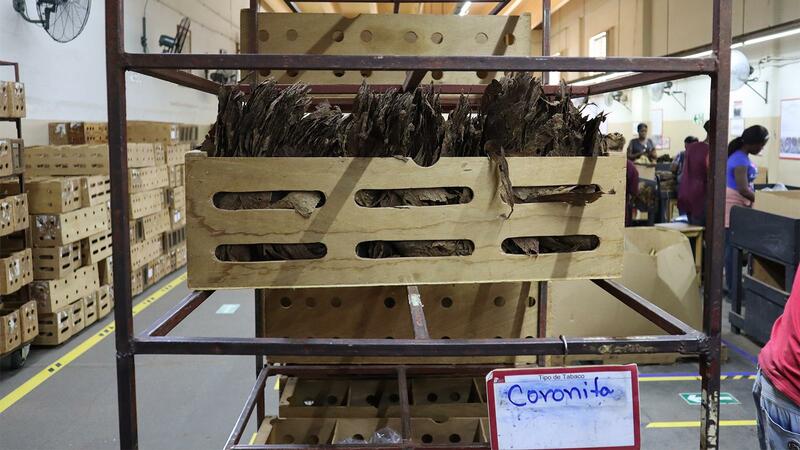 A typical blend box full of different tobacco leaves. These apportioned boxes contain complete blends that will soon go to a buncher who will then put the filler bunch into a binder and then into a cigar mold. 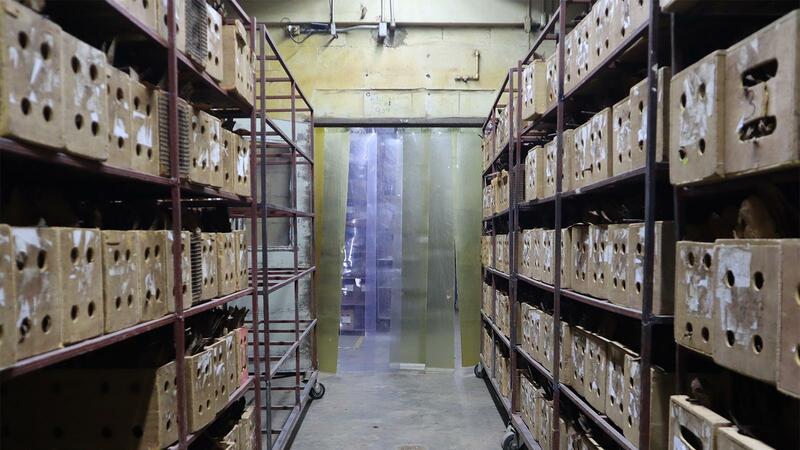 Blend boxes go into a drying room for a while in order to get all the tobacco to the same humidity level before the cigar is rolled. And here is where my camera died and the tour abruptly ends.